The run up to Christmas might not seem the ideal time to get the decorators in. Over the summer we flirted with the idea of moving house. We found something that we liked which doesn't happen all that often because this place is a place we love. But it didn't come together and, with something like relief, we have committed ourselves to this house again for another little while. We won't live here forever. With a house and a holiday cottage and six outbuildings, two greenhouses and a couple of acres of land, it is not a house in which to grow properly old. 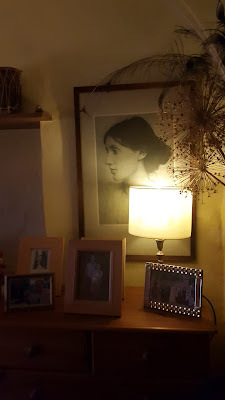 But for now we will happily stay here and as part of falling back in love with the house I wanted to reconnect with it which means giving it some time and attention. So first of all we had our bedroom and the landing where we keep our books (well some of them) redecorated. It is quite extraordinary how much stuff we have and how emptying a room makes the whole house overflow with things! It is as if a flood of stuff has washed through the house leaving piles of flotsam and jetsam on beds and in corners. How did we ever come to have so much stuff? 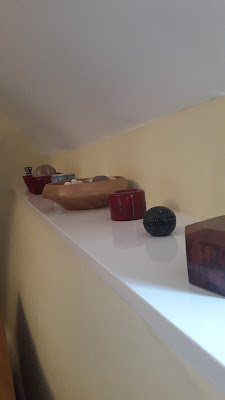 And then to put things back in their proper places, attempting a bit of judicious culling, is so satisfying, and emptying and refilling the spaces makes you look at them again. I don't think of myself as someone who is particularly good at design and visual things. 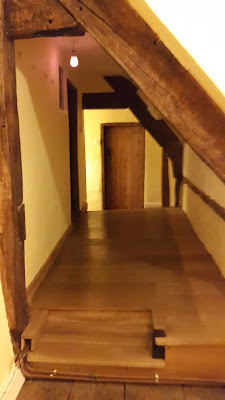 My mother was very good indeed at making houses comfortable and welcoming so I know what I want my house to feel like but I don't always know how to make that happen. This house makes it easier because the house itself is so interesting and the old shapes of its construction so beautiful that you don't have to do very much to it other than let it speak for itself. So here is the landing upstairs repainted and waiting for its books to go back. And the books going back on the shelves. I discovered that this was a job which I had to do in short sessions: do it for a short while and I could take real pleasure in sorting and alphabetising and making sense of things. Do it for too long and the desire to be finished with it and just bung things on the shelves and run away would get too much for me. Then our bedroom got the treatment and we did some major moving around of furniture so as to have a bigger bed and to release one of our spare bedrooms to become a sewing room and study. For a week or so we camped in the guest bedroom and then took back our bedroom. It doesn't look very different to be honest but just different enough to make me see it all over again. And the sewing room came together with vast sorting of my stash of fabric and yarn and much muttering over the reorganisation of books. I still have things sitting in cardboard boxes for the charity shop but it is nearly there. It has one of the best views in the world anyway! 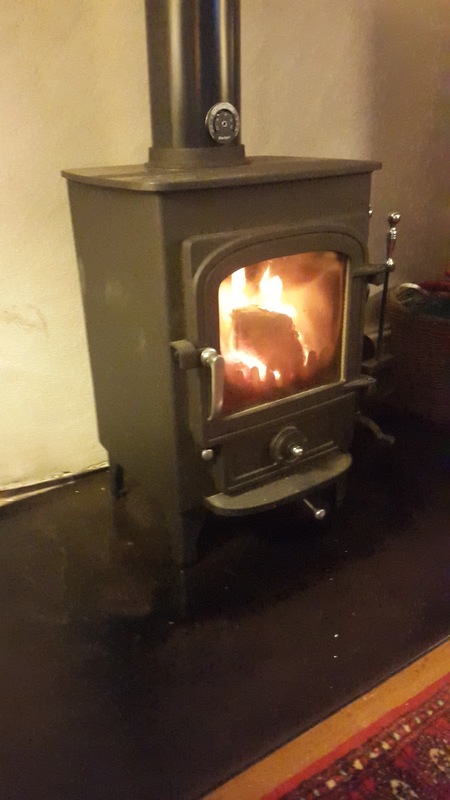 And then came the new woodburning stove in the sitting room. This was supposed to be a half day job to install. Wrong! We sort of knew this would the case. A four hundred year old house and a straight forward job are words that don't belong in the same sentence. In the end it involved taking the plaster off the wall behind the stove, replastering, and installing a cowl on the chimney. This meant Ian asking a pre-Christmas favour of our local builder who hired a cherry picker and came and sorted it out for us. Diolch yn fawr Gareth! But now the stove is in and is wonderfully warm, easy to light and doesn't eat logs in the way the other one did. The hand made Christmas decorations created by a daughter in law at a Christmas a few years ago before she had children are hanging from the hooks where sides of bacon used to hang long ago when the room was the farmhouse kitchen. We are not finished yet. 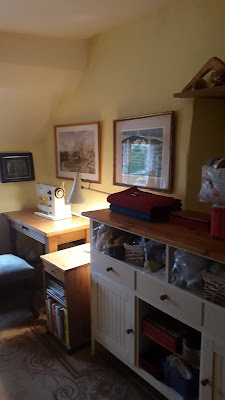 The sitting room itself needs redecorating as does the kitchen but we are nearly there and now it is time to take a break, to sit by the stove and knit or read. We have our younger daughter and her family coming for lunch on Christmas Eve and our turkey was delivered by friends this morning. The rain is throwing itself against the windows and the wind is tearing at the yew trees but inside it is quiet and warm and calm and for the time being everything is in the right place. Merry Christmas everybody. I hope yours is happy and full of the people you love. Thanks Elizabeth. The same to you and Ian too. House looking lovely. Thank you Neil. Of course the beauty of photograohy is that you can point the camera away from the boxes of things for the charity shop! Hope you had a great day. How wonderfully cosy it looks. We'll stick it out a while longer - and perhaps we should follow your example and do some reorganistion and redecoration. 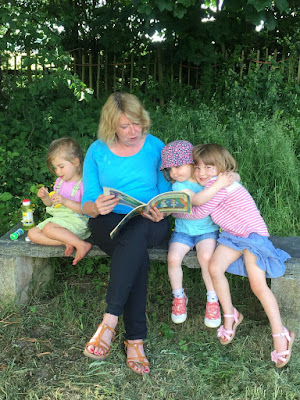 I do know exactly what you mean about outdoor housework and I don't think there is any doubt that the extent to which we had to abandon the garden over the last couple of years with the time away with my dad was a big part of my finding the place overwhelming. Now we have got back on top to some degree and have a very good guy who helps out once a fortnight and it seems less oppressive and more satisfying again. I wondered what your experience would be as there are many things we share in terms of the places we call home! And all the very best to you and yours for 2017. I always wish I had done these refurbishments sooner. They give such great pleasure and it's a good deal less effort than moving. How lovely that you finished in time to enjoy the fruits of your labours over Christmas. I always think winter is the best time for 'spring' cleaning because you see so much more of the inside of your house. You are so right about the refurbishments! They do give pleasure and although they cause the upheaval the upheaval itself is quite energising. And yes, what better time to think about inside than a time of year which requires you to stay inside! It all looks beautiful, have a lovely Christmas enjoying all the hard work. Thank you Rona! Hope you and yours also had a good Christmas and will have a happy and healthy 2017. Dear Elizabeth, I can easily see why you and Ian decided against making a move away from this beautiful home. Perhaps one day, but not now, particularly since you all have completed so many improvements this year. It is a hard one to get right Frances. It would be a huge wrench to leave though so there is a relief for now in deciding to stay put for a while! Have a wonderful 2017 and who knows, perhaps we will see you here sometime next year? You would be very welcome! I would be so sad if you moved! I love your house and your life there - thank you for sharing it with us and Merry Christmas! Thank you Frith. It is a beautiful place and it is heartening to know that other people see that and like it too! Happy new year to you and your boy! I would miss your view. So would we Diana! You have made a big move I know so you will appreciate what it involves! Happy New Year to you! What a wonderful tour. And oh, that view! The view is very special Marme and it would be hard to live without it unless there was another very big compensation! Have a great 2017. My heart opened up (figuratively ;-)) when I saw the view from your window. Breathtaking! Wishing you and your family lots of joy and fun! It is a very special thing to be able to see that view every day. I would say that I don't take it for granted but I am not sure that is entirely true. It is certainly true to say that I love it! And to you and yours Paul and every good wish for 2017! New stoves are something else! Having fun with ours but having to rechop all the wood as it's too big for this one. Quite satisfying job though - Charles thinks it's because I love giving things a good clout. Happy Boxing Day (since I'm too late here to wish you a Merry Christmas, although I can hope you had one). . . I'm selfishly very happy that you've decided to stay put for a while -- I do love seeing photos of your place, and the tour of your improvements was lovely, thank you! 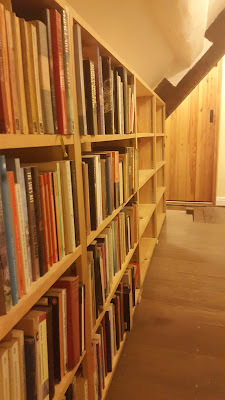 (I'm with you on the book rearranging -- having just finished getting mine back up on new shelves but very aware that some rethinking might be necessary -- plus it's a surprisingly physical task, isn't it?! I have also followed your move with great interest frances. Could I do that? Could I live in a city again and more to the point do I want to? I think I could if like you that took me close to my family but as our children are scattered and one is not too far from here I suspect that this area will continue to hold us, somewhere or other! Two years ago after being 'sensible' and down-sizing we had an opportunity for a property with acreage, barns, and two large farmhouses. This is an Amish-built home, so the modern trappings of plumbing and electricity needed to be installed. 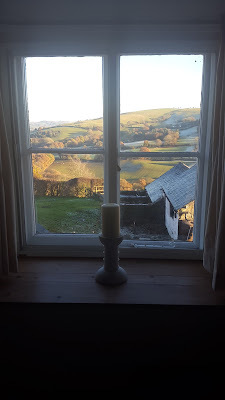 There are moments, usually in the dead of night, when I ponder what the next few years could bring in terms of being able to manage here, but we are both committed to our country lifestyle for as long as it can remain possible. When the time comes, we will downsize all over again. the whole question of downsizing is really tricky. 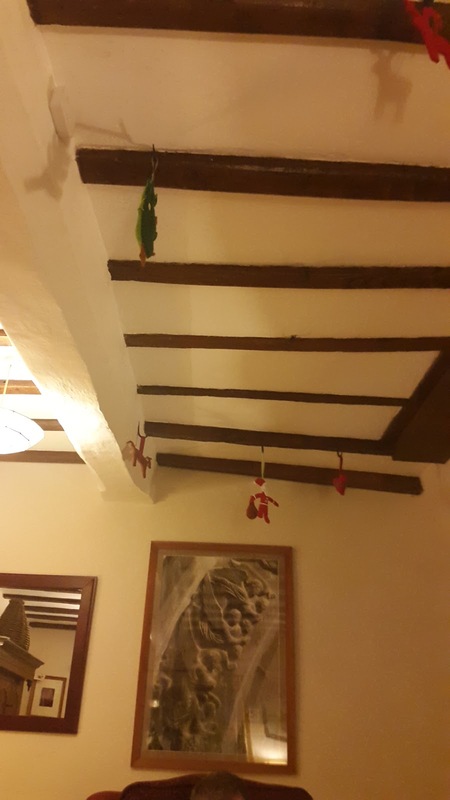 my parents did it too early and moved again to something more interesting for a while. conventional wisdom is that most people leave it too late. I'd like to have the energy and interest to make whatever we do next into our next adventure. but when? that's the question. I felt just the same Chris! I often feel that our lives have some parallels which is fascinating. Hope for a happy and peaceful 2017 for you and yours. 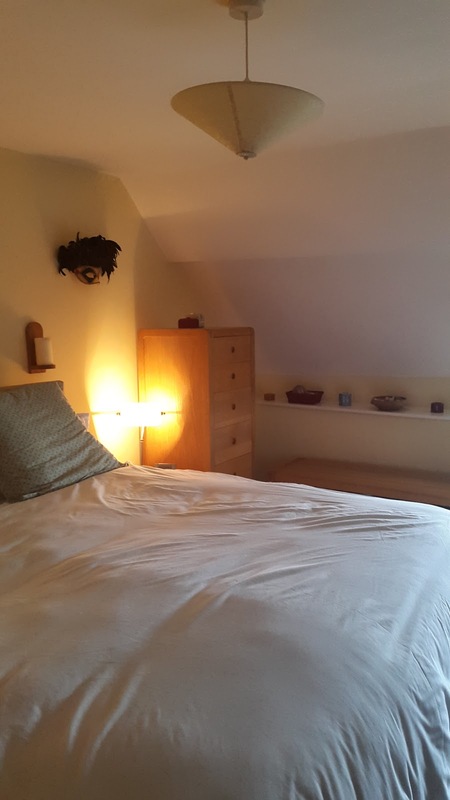 As you know, we have also been through the same process of flirting with moving house and relocating, and like you, having decided to stay put, we have been doing a certain amount of redecoration and house and garden improvements, so all this resonates with me. It does help to make it feel more ours and is long overdue in our case and increases our enjoyment of our home. It would be hard to leave although I still don't feel rooted. I very very much hope you will come and see us Marianne! I know you come to Wales from time to time and if you are going anywhere in North Wales we would not be too far away. Let us try to make it happen in 2017! Re-engaging with the house has certainly made me feel more attached here again. I suppose I am beginning to feel routed in the area which is interesting for me because I have lived in many places and have tended to feel that my family is my root so having, after eleven years, more of an attachment to place is new for me! And to you! Hope 2017 is good to you! Breathtaking! Wishing you and your family lots of joy and fun!